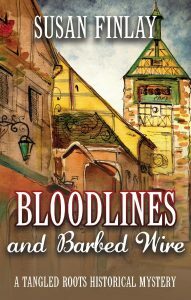 I’m pleased to announce that Bloodlines and Barbed Wire is published! The Kindle version is now available on Amazon. The paperback version should be available later today or tomorrow. I hope you’ll grab your copy right away. It’s helpful to get a new book off to a good start. Thanks! Lucas Landry receives an email from a teenager, Mikayla Carson, who thinks her legal guardian and great-grandmother, Elisabeth Hoffman, is related to his great-grandfather, Franz Nagel. She’s not certain, because Elisabeth suffers from dementia. Mikayla wants Lucas to help her find out more about her family’s past. As a genealogist, Lucas is eager to untangle the family roots. He travels to Arizona to meet Mikayla, her younger brother, and Elisabeth, and begins reading old Nagel-family diaries, but his eagerness dampens when he discovers Nazis in their bloodline. Further complicating the task, he can’t even figure out how Elisabeth is related to those Nagels, and she can’t explain, either; her mind is a jumbled mess and her answers to his questions are unreliable. He returns home, ready to give up until two events pull him back in—his discovery of an old newspaper clipping about the war-time murder of one of the Nagels, and Mikayla’s frantic call about the danger of her family being torn apart unless a family member steps in and helps. Against his wife’s wishes, Lucas returns to Arizona and delves deeper into the WWII diaries, learning about a Lebensborn home, a Polish concentration camp, and the tragic lives of three Nagel teens; their father’s young mistress; and two nieces. But will those diaries tell what he really needs to know and empower him to help Elisabeth and her great-grandchildren? Leave a reply on "Announcing New Release!"